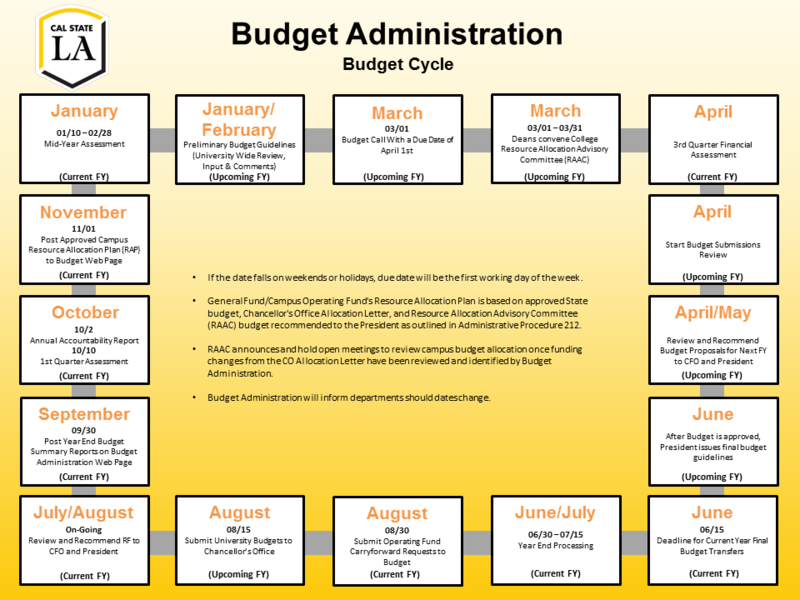 Budget Administration provides a variety of on-going training and workshops on the campus budgetary process. We provide in-person and online training by leveraging technology in our service delivery by incorporating online and cloud-based conference solutions like Zoom to reach a wider campus audience. Provides an introduction to the Oracle-Enterprise Planning and Budgeting System (ePBCS). Cal State LA’s has implemented ePBCS to serve as the campus’ budgeting and management reporting system. The system integrates enterprise wide planning and budgeting processes while providing cloud-based reporting and interface solutions. Provides an overview of the University's annual budget planning and development process including the new budget forms in support of the All Funds Budget Model. In addition, the workshop includes discussion of different approaches to completing the new budget forms including tips on effective reporting, performance metrics, etc. Provides an overview of the campus carryforward request procedure. Division and department resource managers will have a better understanding of timeline, required forms, and overall process of submitting year-end budget carryforwards. Provides an introduction to the University’s budgetary process. This training session provides an understanding of the sources and uses of campus resources, the campus resource allocation process, campus chart of accounts, and various financial and budgetary tools available for reconciliation and analysis purposes.